Nearly a third of MPs and almost two thirds of members of the House of Lords were educated privately, compared to 7% in the wider population, figures show. A report by the Sutton Trust charity says politicians' educational profiles do not match those of society at large. It also found 27% of the Commons and 42% of the Lords were educated at Oxford or Cambridge universities. The trust's chairman, Sir Peter Lampl, said the findings were symptomatic of an "educational apartheid". The report shows Labour MPs who are ministers are more likely to have been to an independent school (25%) than Labour backbenchers (16%). They are also more likely to have been to Oxbridge - 23% against 15%. Over the last 50 years the representation of privately-educated MPs has been generally falling. The trend shows the proportion of Conservative MPs from independent schools has fallen from 70% of those elected in 1983 to 59% now. But the representation of private schools on the Labour benches has increased, from 14% to 18%. The Liberal Democrat statistics fluctuate, reflecting the fact that the party has held relatively few seats, the trust said. Sixty-two per cent of Opposition office-holders under former leader Michael Howard were privately educated and 46% were Oxbridge graduates. Of the 15 Old Etonians in the Commons, all but two serve on the Conservative benches. 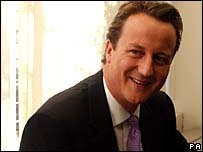 They include the party's new leader, David Cameron, who also went to Oxford University - as did Labour leader Tony Blair following his schooling at the private Fettes College. Liberal Democrat leader Charles Kennedy went to a state school, Lochaber High, and Glasgow University. More than four out of every 10 of the 391 privately-educated members of the House of Lords attended just 12 top private schools: Eton (82), Winchester (11), Harrow, Stowe and Westminster (10 each), Shrewsbury (9), Rugby (8), Charterhouse and St Paul's (7 each), Ampleforth, Marlborough and Radley (6 apiece). The same proportion of MPs - 43% - attended one of the top 13 universities which the Sutton Trust says have the highest average ranking in newspaper league tables: Birmingham, Bristol, Cambridge, Durham, Edinburgh, Imperial, LSE, Nottingham, Oxford, St Andrew's, UCL, Warwick, York. The report concludes: "It is important to ensure the opportunity to attend these universities is open equally to all young people on the basis of merit." But the trust has shown previously that, relative to their A-level achievements, those from state schools, poorer neighbourhoods and lower social classes are under-represented. Sir Peter said: "The educational profile of our representatives in Parliament does not reflect society at large." He added: "This is symptomatic of a wider issue - the educational apartheid which blights our system and which offers the best life chances to those who can afford to pay for their schooling."